This coloured lithograph of ‘A Primrose from England’ was created in 1856, engraved from the original oil painting first exhibited at the Royal Academy in London in 1855. The central feature in this painting is a larger-than-life primrose in full flower. The artist Edward Hopley was inspired to create his painting by reports of an actual event: he transportation of a primrose from England to Melbourne made possible – to the profound excitement of the colonial populace – by the invention of the Wardian Case in 1933. 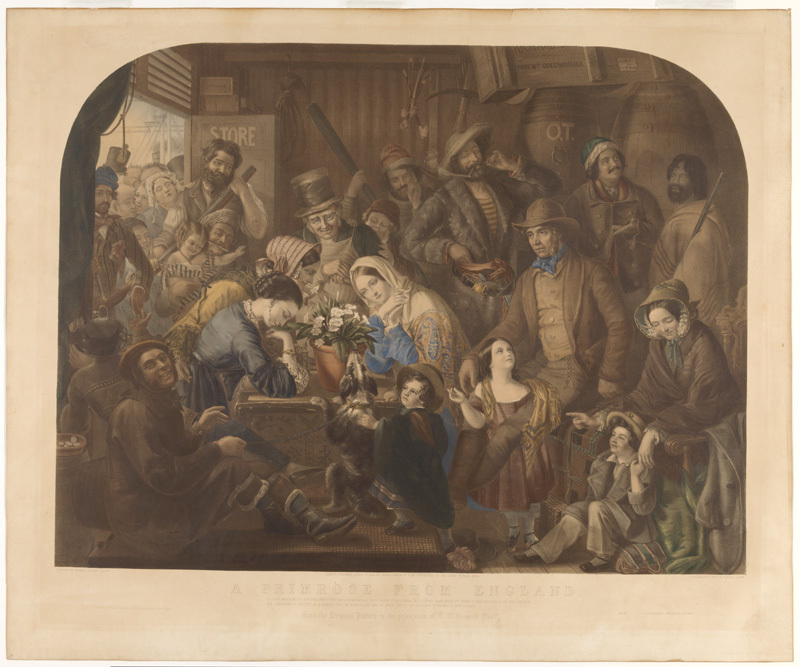 The image was so popular when it was exhibited that it was quickly made into a lithograph print for the mass market. 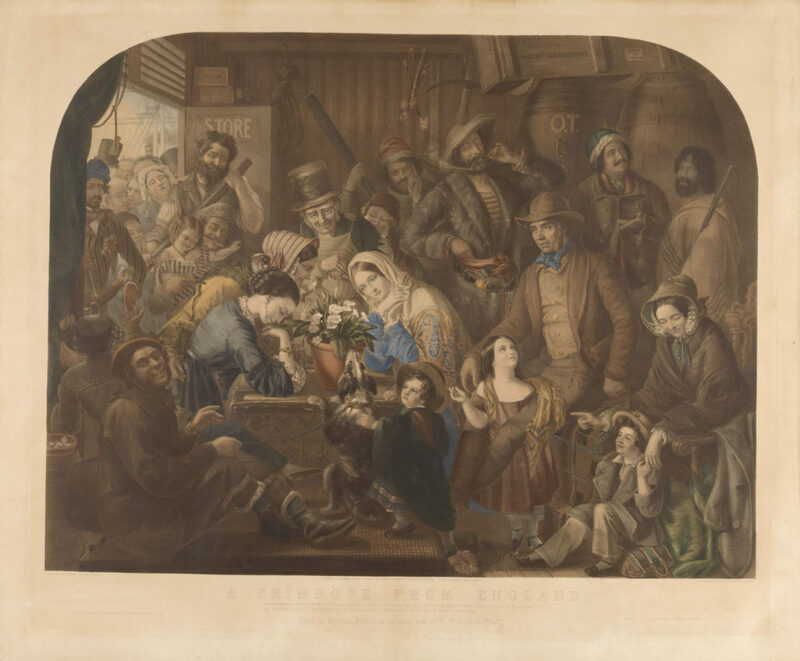 Though the original painting was created in England, the artist has been careful to craft an image that offers a richly layered narrative on the dual theme of immigration and colonization, using his subject as a vehicle for exploring the emotions associated with the nineteenth century emigrant experience. He portays a diverse and multi-racial, cross-section of migrants, each stereotypical of his or her class or station in life, gathered round the Primrose, with individuals from different social strata intermingled in a potentially chaotic space, while others crowd the doorway anxious to gain access to the colony’s latest European import. a cluster of people fill the doorway with a bespectacled older man, a younger man, a servant class woman and a Chinese man (his plaited ‘queue’ wrapped around his head) and the headgear of others visible including a soldier’s shako, the rim of a woman’s straw bonnet and a man’s top hat. an Indigenous man wearing a blanket-like garment and carrying a tall staff. an [agricultural] labourer [perhaps a shepherd] wearing a reddish brown felt cap and travelling with his a black and white collie dog tethered to a plaited leash. and two women opposite – [a mother and daughter or sisters] the elder, leaning over to admire the bloom, wears a pale pink bonnet of shirred silk, its inside edges trimmed with white flowers, above her ensemble of matching yellow silk gown and jacket/cape with ‘pagoda’ sleeves, trimmed with fine black lace, her arm around the waist of her younger companion who is bare-headed, revealing her stylishly-arranged dark hair and long gold pendant earrings, above an elegant day dress of [shot] purple [silk] with wide ‘pagoda’ sleeves and white, ruffle-edged undersleeves, open at the wrist to reveal slender forearms and an ornate gold bangle set with red stones. The ‘Wardian Case’ had revolutionised the transportation of plant specimens throughout the British Empire; the glass case enabled plants, such as the primrose, to survive the long sea journey to Australia with a minimum of watering. The arrival in the Australian colonies from England of a primrose in perfect health gave British migrants a belief in the future of their adopted country; if the fragile the primrose could flourish in the new land, so too could other English life forms such as the women, at the centre of the image, who are themselves symbols of European civilisation, domesticity and fertility.